Have you heard of a naked cake? These seemed to have become popular a few years back when all of the rustic glam weddings were done either outdoors or on a farm setting. Most brides didn’t want a “fancy” cake in this simpler setting, but wanted a cake more fitting of the surroundings. 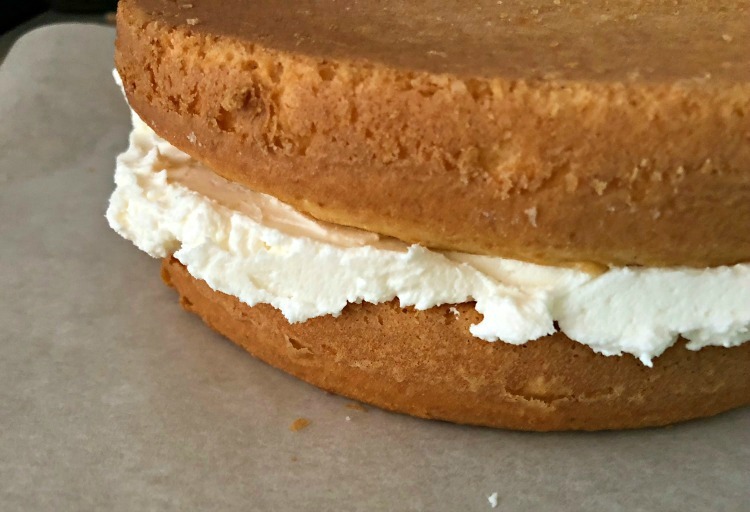 Making a naked cake is so simple. These are great for everyday, or for most any special occasion such as a wedding or baby shower, birthday, or holiday. I started with a boxed cake mix – yes, I use these quite often for my cakes. When using a white or yellow cake, I add about a Tablespoon of Almond Extract to add just a little more flavor. But of course you can always make your favorite recipe. After baking your cake following directions on the box, let cool completely. When cool, place in the freezer for about 30 minutes to let it firm up, but not completely frozen. One of my favorite tools when making a cake is a cake leveler. With this you can have all of your layers even. You can cut it with a serrated knife also, but he cake leveler makes it so easy. The leftovers are a great little snack before you serve this cake. I always frost the bottom of the layer to prevent so many crumbs getting into the frosting. For a normal frosted cake, I would do a crumb coat, chill, then frost. Talking about frosting, here’s THE BEST BUTTERCREAM EVER recipe. I like to frost my cake on a turn-table with a sheet of parchment paper under it. 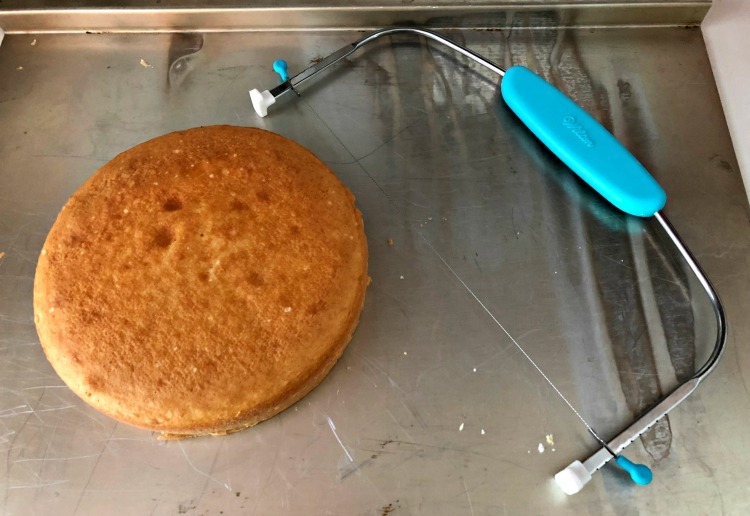 The cake can then be transferred to a cake stand using a cake lifter. 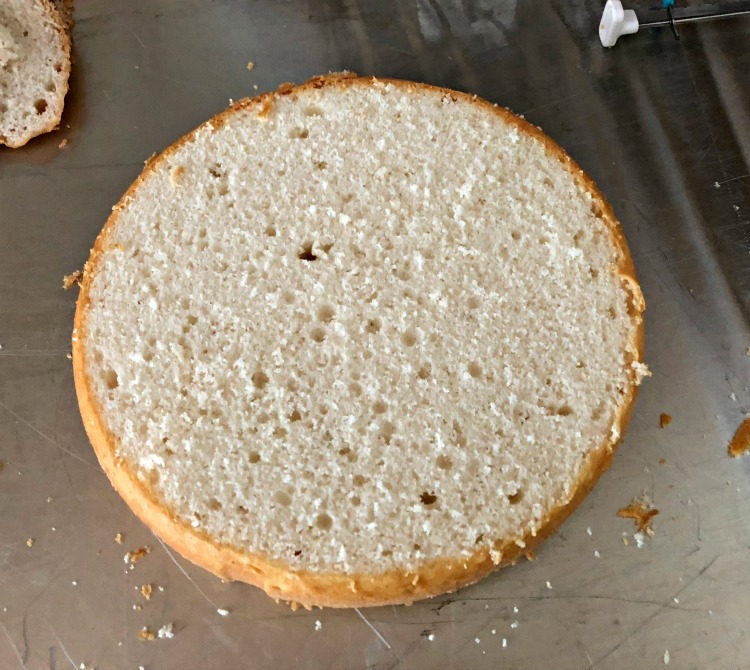 Turn your first layer with bottom facing up. Depending on size of layer will depend on how much frosting you use. For this 8″, it was about 1 1/2 cups. Another hint is to use an ice cream scoop so you can measure a bit more accurately.. Most scoops are about 1/3 – 1/2 cup. Spread the frosting with an offset spatula, letting the frosting extend past the edge. This is what will fill in the gap between the layers. Smooth the frosting so it is level. Add the 2nd layer, again having bottom facing up. Again using your offset spatula, spread the frosting to fill in the gap between the layers, adding a little more frosting if needed. As you spread this, smooth a very thin layer of the frosting onto the outer edge of each layer. Repeat for each layer added. 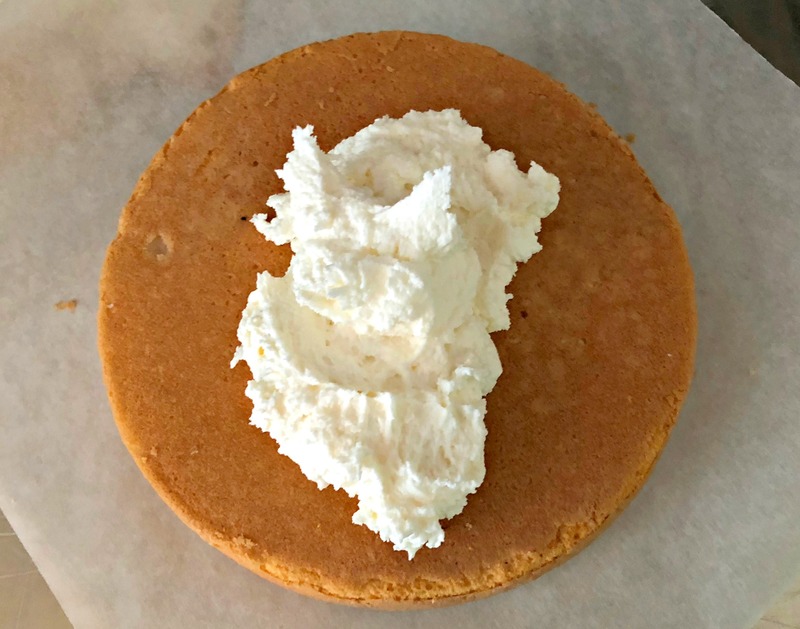 Add enough frosting to the final layer to smooth out evenly. 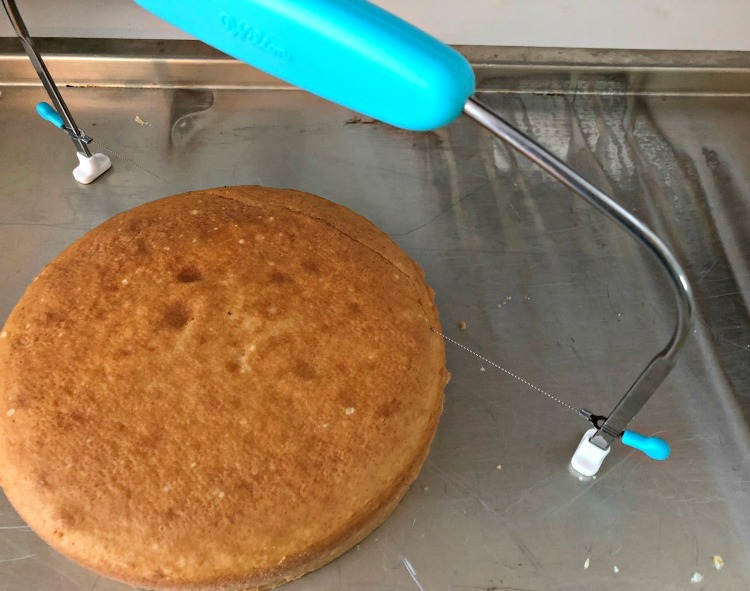 It’s pretty easy to get a smooth edge by just rotating the turntable and holding the spatula against the cake edge. Fresh fruit or fresh flowers are always great for decorating. 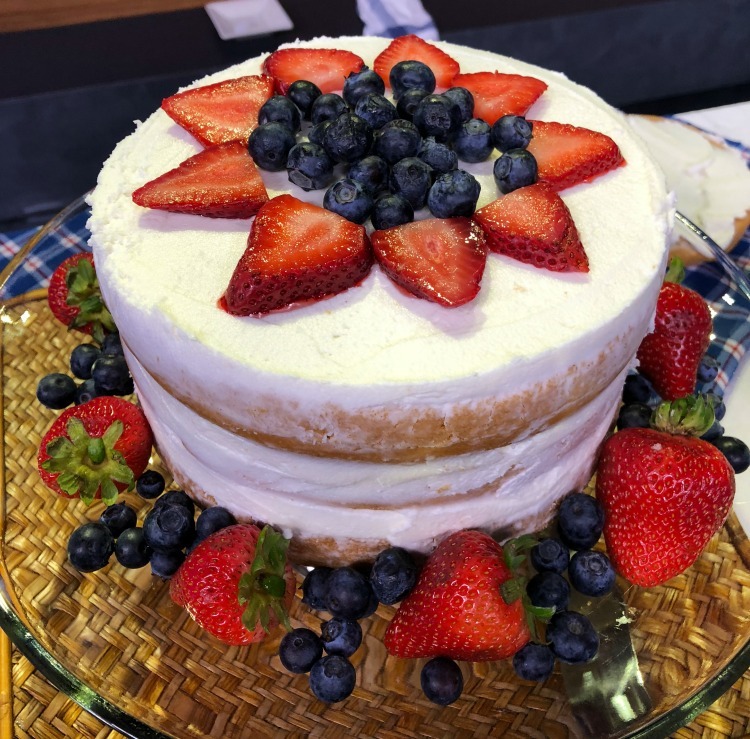 Strawberries and blueberries are great for the upcoming 4th of July. You would be the most popular person at the party when you show up with one of these. Raspberries and blackberries, or any combination of any of these are delicious too. 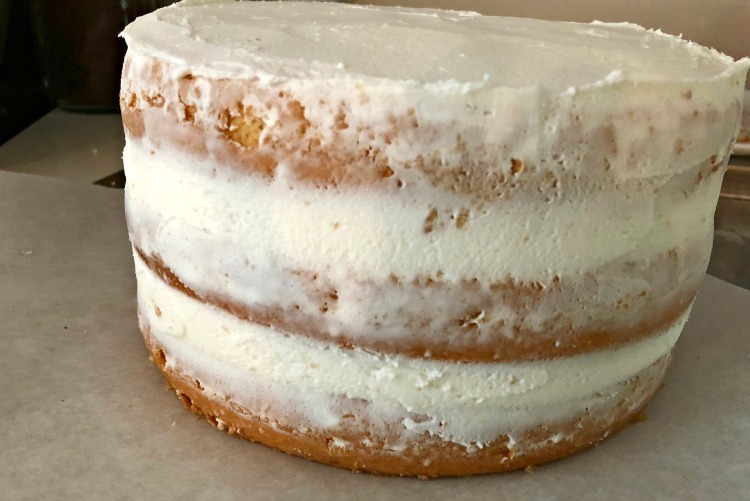 With all of the butter in the frosting, I suggest storing this in the refrigerator but you can remove an hour ahead of time if you like it at room temperature better. Cake decorating has been a long time hobby for me. 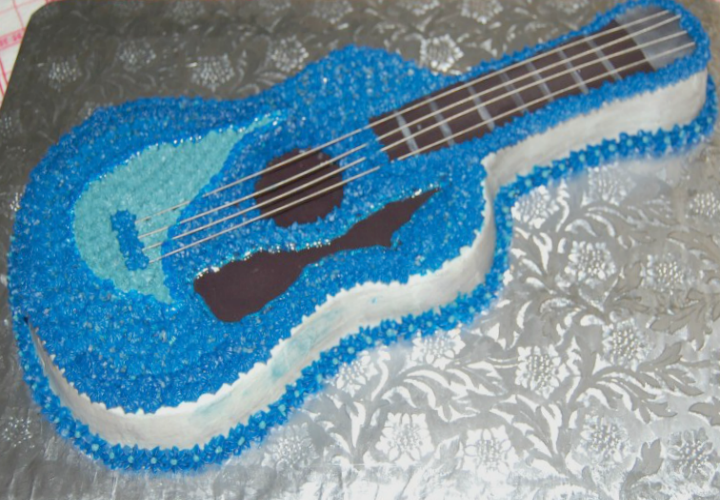 This guitar shaped cake pan was a Christmas gift when I was about 13, being ordered from Sears. Here’s a link to This N That, a local show I appeared on recently. That cake looks delicious with its berry decor!! Perfect for the 4th! I learned a lot from this simple little post! The tools AND turning the layers upside down! New to me! Thanks, Rosemary! Pinned! It’s amazing how simple this can be and thrown together quickly. Tools for any project sure makes a difference.